Hesychasm (from Greek: ἡσυχασμός hesychasmos, meaning "stillness, rest, quiet, silence") is an eremitic tradition of prayer that developed in Eastern Orthodox Christianity. Rooted in the ancient tradition of Christian asceticism and contemplation, the Hesychast interprets Christ's injunction to "go into your closet to pray" (Matthew 6:6), to mean that one should ignore the senses and withdraw inward to acquire an inner stillness and to apprehend the light of God. Especially popular among the monks of Mt. Athos, Greece, Hesychasm flourished in the fourteenth century C.E. and became an official doctrine of the Greek Orthodox Church in 1351 C.E.. The distinctive characteristics of Hesychasm are its emphasis on solitary mental ascesis and contemplative stillness, repetition of the "Jesus Prayer," reading of the Philokalia (a collection of texts on prayer written from the fourth to the fifteenth centuries), and a theology of Uncreated Light. Though not well known or understood in other branches of Christianity, the ancient practice of Hesychasm remains a very respected part of the Greek Orthodox tradition. It is often said that Hesychasm has great potential for both renewing interest in Christianity and for establishing a point of common ground among many of the world religions. Hesychasm is renowned as a form of Christian mysticism that seeks to attain a direct experience of God’s light and love. It is well known that mystics from the world’s religions have inspired humanity through their celebration of divine love. The origin of the term hesychasmos is not entirely certain. The basic terms hesychia and hesychazo appear in the fourth century in the writings of the early Cappadocian Church Fathers such as St. John Chrysostom (349– ca. 407). The terms also appear in the writings of Evagrius Pontikos (c.345–399). The Greek term anchorite (Gr. ἀναχωρητής, "one who withdraws or retreats, i.e. a hermit") was often considered to be synonymous with Hesychast. The term Hesychast also appears in the Ladder of Divine Ascent of St John of Sinai (523–603) and in Pros Theodoulon by St Hesychios (c.750). 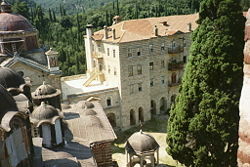 Zograf Monastery, one of the 20 monasteries of Mount Athos. The beginnings of Hesychasm can be traced back to the early Desert Fathers, who retreated from society to go off into the desert to pray. Their prayers often involved stillness and contemplation, similar to forms of mediation practiced in the religions of Asia. Over time, Mount Athos became a centre for the practice of Hesychasm and by the fourteenth century, the monastries at Mount Athos reached the height of their fame and influence. It was at this time, that Barlaam of Constantinople visited Mount Athos and was scandalized by Hesychastic teachings. Barlaam began to attack Hesychasm in his writings, taking particular exception to its doctrine of divine light, which he held to be polytheistic because it postulated two eternal substances—a visible and an invisible God. Hesychasm, in turn, was defended by St Gregory Palamas (1296-368 C.E. ), who vigorously supported its positions at three different synods in the 1340s in Constantinople. Gregory Palamas also wrote a number of works in its defense of Hesychasm in which he used a distinction between the operations (Gr. energeies) of God and the essence of God. He taught that while the energies of God were uncreated, the essence of God can never be known by creatures. In Palamite theology, it is the uncreated energies of God that illumine the Hesychast as an experience of the Uncreated Light. In 1341 C.E., the dispute came before a synod held at Constantinople and presided over by the Emperor Andronicus; the synod, taking into account the regard in which the writings of the pseudo-Dionysius were held, condemned Barlaam, who recanted and returned to Calabria, afterwards becoming a bishop in the Roman Catholic Church. One of Barlaam's friends, Gregory Akindynos, who originally was also a friend of St Gregory Palamas, took up the controversy, and three other synods on the subject were held, at the second of which the followers of Barlaam gained a brief victory. However, in 1351 at a synod under the presidency of the Emperor John VI Cantacuzenus, Hesychast doctrine was established as the doctrine of the Orthodox Church. The Roman Catholic Church has never fully accepted the practice or theology of Hesychasm. In Roman Catholic thinking since the Scholastic period, the essence of God can be known, but only in the next life; the grace of God is always created; and the essence of God is pure act, so that there can be no distinction between the energies or operations and the essence of God (e.g., the Summa Theologiae of St Thomas Aquinas). Some of these positions depend on Aristotelian metaphysics. Hesychastic practice bears some resemblance to mystical prayer or meditation in the Eastern religions, although this similarity is often over-emphasized and generally rejected by Orthodox practitioners of Hesychasm. Its practice may involve specific body postures and be accompanied by very deliberate breathing patterns. However, these bodily postures and breathing patterns are treated as secondary both by modern practitioners of Hesychasm and by the more ancient texts in the Philokalia, the emphasis being on the primary role of Grace. In this passage, St John of Sinai says that the primary task of the Hesychast is to engage in mental ascesis. This mental ascesis is the rejection of tempting thoughts (the “thieves”) that come to the Hesychast as he watches in sober attention in his hermitage. Much of the literature of Hesychasm is occupied with the psychological analysis of such tempting thoughts (e.g. St Mark the Ascetic). This psychological analysis owes much to the ascetical works of Evagrius Pontikos, with its doctrine of the eight passions. The highest goal of the Hesychast is the experiential knowledge of God. In the fourteenth century, the possibility of this experiential knowledge of God was challenged by a Calabrian monk, Barlaam, who although he was formally a member of the Orthodox Church had been trained in Western Scholastic theology. Barlaam asserted that our knowledge of God can only be propositional. The practice of the Hesychasts was defended by St. Gregory Palamas (discussed above). In solitude and retirement the Hesychast repeats the Jesus Prayer, "Lord Jesus Christ, son of God, have mercy on me, a sinner." The Hesychast prays the Jesus Prayer "with the heart"—with meaning, with intent, "for real." He never treats the Jesus Prayer as a string of syllables whose "surface" or overt verbal meaning is secondary or unimportant. He considers bare repetition of the Jesus Prayer as a mere string of syllables, perhaps with a "mystical" inner meaning beyond the overt verbal meaning, to be worthless or even dangerous. There is a very great emphasis on humility in the practice of the Jesus Prayer, great cautions being given in the texts about the disaster that will befall the would-be Hesychast if he proceeds in pride, arrogance, or conceit. In addition to repeating the Jesus Prayer, the Hesychast is required to cultivate sobriety (Gr. nepsis) where extreme attention is devoted to the consciousness of his inner world and to the words of the Jesus Prayer, not letting his mind wander in any way at all. The Hesychast is to attach Eros (Gr. eros), that is, "yearning," to his practice of sobriety so as to overcome the temptation to accidie (sloth). He is also to use an extremely directed and controlled anger against the tempting thoughts, although to obliterate them entirely he is to invoke Jesus Christ via the Jesus Prayer. The Hesychast is to bring his mind (Gr. nous) into his heart so as to practise both the Jesus Prayer and sobriety with his mind in his heart. The descent of the mind into the heart is taken quite literally by the practitioners of Hesychasm and is not at all considered to be a metaphorical expression. Some of the psychophysical techniques described in the texts are to assist the descent of the mind into the heart. The goal at this stage is a practice of the Jesus Prayer with the mind in the heart, which practice is free of images (Pros Theodoulon). What this means is that by the exercise of sobriety (the mental ascesis against tempting thoughts), the Hesychast arrives at a continual practice of the Jesus Prayer with his mind in his heart and where his consciousness is no longer encumbered by the spontaneous inception of images: his mind has a certain stillness and emptiness that is punctuated only by the eternal repetition of the Jesus Prayer. This stage is called the guard of the mind. 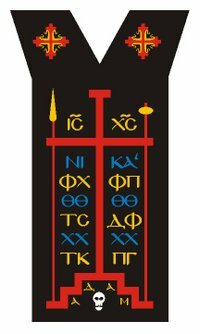 This is a very advanced stage of ascetical and spiritual practice, and attempting to accomplish this prematurely, especially with psychophysical techniques, can cause very serious spiritual and emotional harm to the would-be Hesychast. The guard of the mind is the practical goal of the Hesychast. It is the condition in which he remains as a matter of course throughout his day, every day until he dies. It is from the guard of the mind that he is raised to contemplation by the Grace of God. 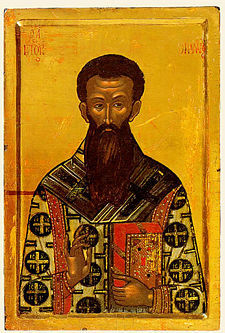 The Hesychast usually experiences the contemplation of God as light, the Uncreated Light of the theology of St Gregory Palamas. The Hesychast, when he has by the mercy of God been granted such an experience, does not remain in that experience for a very long time (there are exceptions, but he returns "to earth" and continues to practise the guard of the mind. The Uncreated Light in Hesychast experience is identified with the Holy Spirit. Notable accounts of encounters with the Holy Spirit in this fashion are found in St Symeon the New Theologian's account of the illumination of "George" (considered a pseudonym of St Symeon himself); in the "conversation with Motovilov" in the Life of St Seraphim of Sarov (1759 – 1833); and, more recently, in the reminiscences of Elder Porphyrios. Orthodox Tradition warns against seeking ecstasy as an end in itself. Hesychasm is a traditional complex of ascetical practices intended to purify the member of the Orthodox Church and to make him ready for an encounter with God that comes to him when and if God wants, through God's Grace. The goal is to acquire, through purification and Grace, the Holy Spirit and salvation. Any ecstatic states or other unusual phenomena that may occur in the course of Hesychast practice are considered secondary and unimportant, even quite dangerous. Moreover, seeking after unusual 'spiritual' experiences can itself cause great harm, ruining the soul and the mind of the seeker. Such a seeking after 'spiritual' experiences can lead to spiritual delusion (R.u prelest, Gr. plani)—the antonym of sobriety—in which a person believes himself or herself to be a saint, has hallucinations in which he or she "sees" angels, Christ, etc. This state of spiritual delusion is in a superficial, egotistical way pleasurable, but can lead to madness and suicide, and, according to the Hesychast fathers, makes salvation impossible. The Latin writings of St. John Cassian (ca. 360 – 433), especially his works Coenobitical Institutions and the Conferences, represent a transmittal of Evagrius Pontikos’ ascetical doctrines to the West. These works formed the basis of much of the spirituality of the Order of St Benedict and its offshoots. Therefore, the influence of St John Cassian on the spiritual practice of Western monasticism indirectly parallels Hesychasm practice in the Orthodox Church. ↑ The contemporary historians Cantacuzenus and Nicephorus Gregoras deal very copiously with this subject, taking the Hesychast and Barlaamite sides respectively. This page was last modified on 22 December 2017, at 20:21.